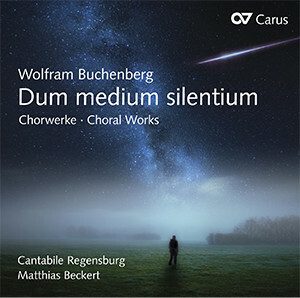 In his sleeve note to the latest CD by the Cantabile Regensburg ensemble and its conductor Matthias Beckert, Wolfram Buchenberg writes that it is the “direct emotional access of people to each other through their voices” which fascinates him most and constantly inspires him to compose music for choir anew. 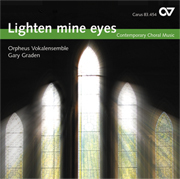 The ensemble is particularly committed to exploring contemporary choral music – what a stroke of luck that this led to a collaboration with Wolfram Buchenberg whose compositions are now greatly in demand on the international choral scene. 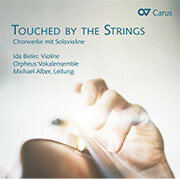 Buchenberg's compositional style, at the same time modern and yet tonal, is characterised by colorful harmonies, soloistic elements, the inclusion of spoken texts and breaking out of traditional rhythmic structures. Elements which are typically found in the choice of works – from folk song arrangements, through “Aber heidschi bumbeidschi”, to the Christmas carol “O Freude über Freude!”.